I have been quiet around here, real quiet. I even skipped a few Monty Monday posts. I promise, there hasn't been a shortage of photos taken, or words meant to be written, just a shortage of time. We found a house. And when we aren't working, our lives are consumed with packing paper, endless rolls of tape, magic markers, brown paper boxes, and one anxious dog. My cousin came for a visit a few weeks ago. Before leaving the house to pick him up at the airport, I decided to check Zillow. Thinking and hoping I would find a hidden treasure. A house that wasn't filtered in our daily email of new-house listings. A house that fit all of our criteria. A house that was in a good school district (planning ahead and no we aren't reproducing yet). A house that was near walking paths. A house in an established neighborhood. A house that didn't require $50K in renovations. And a house that we could eventually call our own. 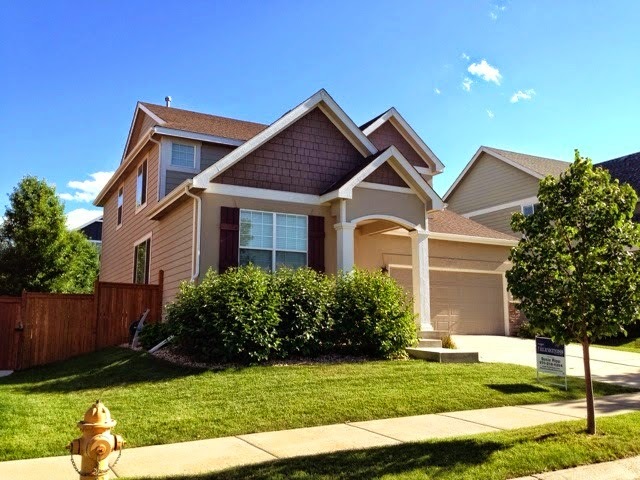 I found a "new" listing as soon as I typed in Fort Collins, Colorado. The outside of the house caught my eye immediately, but we've learned that often times that means the inside of the house is falling apart. I started scrolling through the 22 photos available and called the listing agent. She said, "I just listed that house a few minutes ago, but we aren't showing until Thursday." It was only Tuesday. I immediately text the link to Mr. B. He replied within minutes and said, "This is the one." We knew it two days before we even stepped inside. So I emailed our agent and asked if she could set up an appointment on Thursday. We showed up at the house that day and to no surprise, fell in love. We wanted to put an offer in that very second, but knew we needed to be strategic and go in with our strongest offer yet. They had two open houses scheduled for that weekend and planned to review all offers Sunday evening. We knew we were going to have a lot of competition, so we took that evening to review the market analysis, discuss our budget, get creative with our offering, and write a heartfelt letter to the sellers about why we wanted their home. Our Realtor submitted our offer on Friday the 13th (June). We held our breath and headed out of town on a family camping trip that weekend. On Sunday afternoon, we drove a few miles to get phone reception. Texts and emails were flooding in from the two days prior, but the only message I was interested in was the one voicemail I had waiting for me. It was from our Realtor and said, "Call me, I think you guys are in the lead." The sellers had five offers on the table. The letter we had written had won the seller's heart. Enough so that when a sixth offer was on it's way, they turned it down, because the wife had already made up her mind - us. 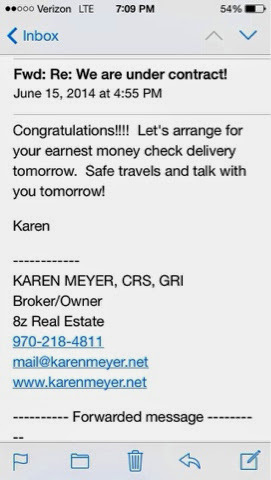 There were a few questions left outstanding that we needed to reply too and our Realtor said she'd call us in three hours with the news - hopefully good news. With tears in our eyes, Mr. B and I hugged, clapped and may or may not have jumped up and down. There were a few hoops to jump through following that day, but we were officially under contract and had faith that the rest would work itself out. The advice I received most throughout this house buying process was, "If it's meant to be, everything will fall into place." And they were right. The first two houses we put offers on were great houses, but looking back, they really weren't the best option for us. There was something about this house that felt right from the beginning. The way I found it and the "holidays" associated with house-buying-milestones. We submitted our offer on one of the most superstitious days of the year. And the day we went under contract was a day shared with honoring both of our fathers (Father's Day). One father who has been a sounding board for us throughout this entire house buying process and the other watching over from above, whom I believe had a hand in making this house become ours. Not to mention, our new good luck charm, my cousin Seany. I think we need him around more often! This house is awesome, yes, but you know we are even more excited about? 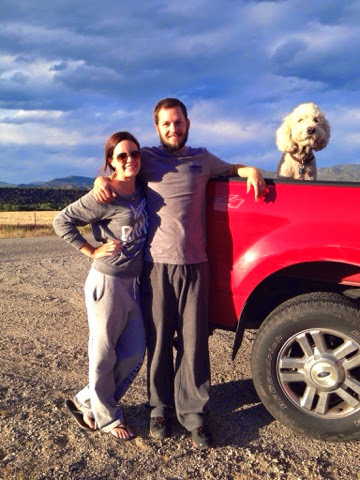 We don't have to live in a 500 square foot apartment or our 19 foot box on wheels, permanently. Fifteen more days until this lovely home is ours. Well, legally. We won't actually be moving in until August. Keep sending us good vibes, that everything continues to go smoothly. Very exciting, love! I've been wondering about you guys! (And awaiting a post) ;) Let me know when you guys are all settled when the time comes... I know you have a bit. Joel and I will bring over a bottle of wine and some baked goods-- made with love, (by Joel, of course)!